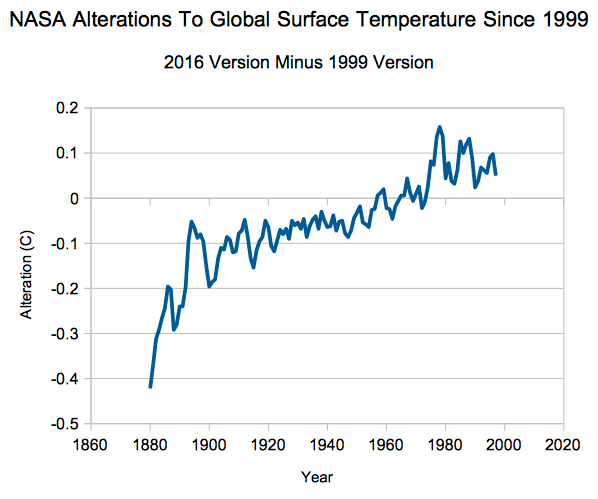 NASA currently shows 1.0C warming prior to 1996. 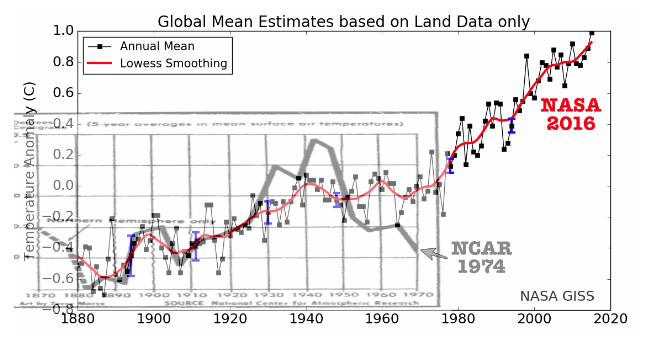 In their 1999 version of the same graph, they showed half that much warming prior to 1996. 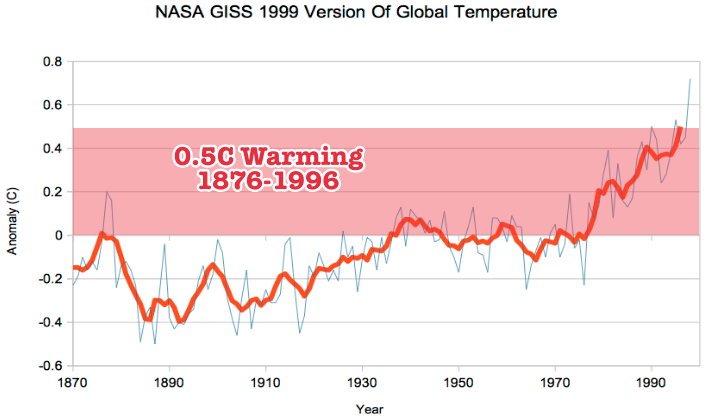 Note that Gavin has since dropped the inconvenient pre-1880 warm temperatures. Besides dropping the warm pre-1880 temperatures, Gavin has massively altered the 1880 to 1996 temperatures. This is of course on top of all of Hansen’s spectacular pre-1999 data tampering, which had already wiped out almost all of the 1940’s warmth and 1940-1976 global cooling. Gavin’s tampering increases month after month. 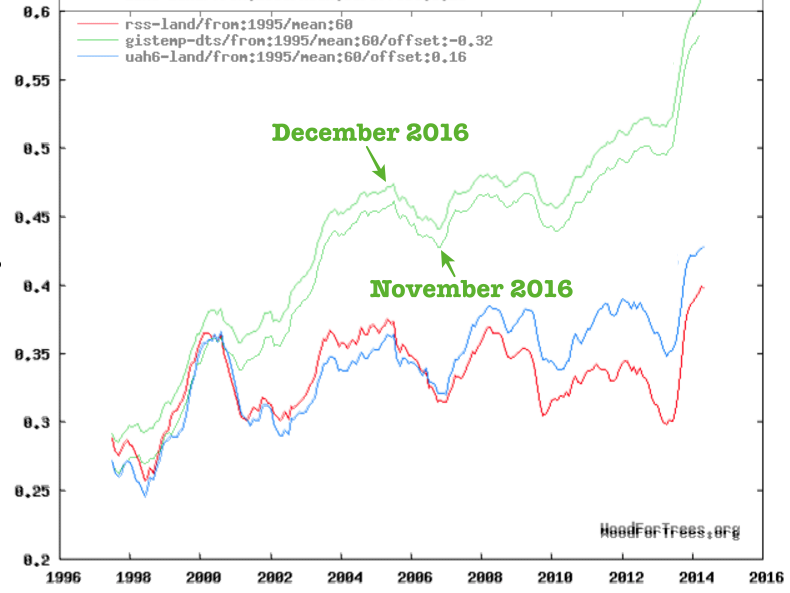 Not only is his pre-1996 data fake, but his post-2000 data is also fake. Gavin Schmidt is the key player in the biggest scientific scam in history. Almost all climate superstition derives from his fake temperature graphs. Like this “climate change is real” tweet. Any thoughts on skepticalscience.com? In my opinion it seems strange that activists such as Nucitelli and Cook are considered representative of the science. 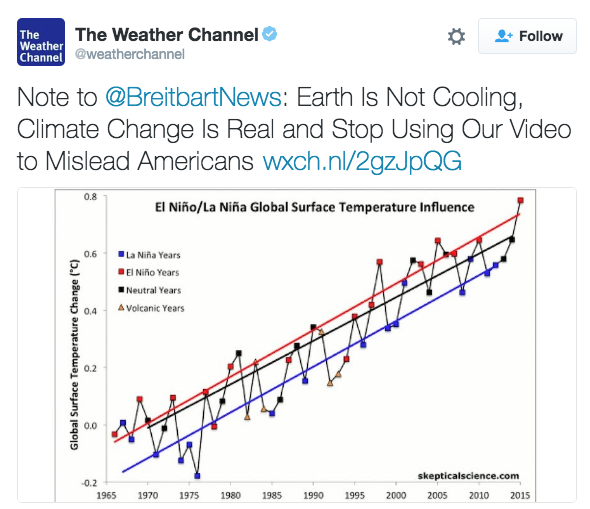 Worst fake climate news site on the Internet. No Tony, its the best fake climate news site on the Internet….they do fake 97% better than most others. Nucitelli and Cook ARE representative of “climate science™”. Both are rabid propaganda monkeys. It is scary that any scientist could be allowed to get away with outright data tampering. That other scientists are still referencing their work is appalling. Not only get away with but is being paid well by tax payers to do it! There is even a fund for legal fees to ‘Protect’ the fraudsters. Asking for emails written on computers paid for by the public on time that was paid for by the public is considered invasive and unjustified. What crock! I hope that Mann and others will be properly called to account for their activities. Maybe RICO could be used against members of this CSLDF organization. I keep thinking about Admiral Michael Rogers, the Director of the NSA (National Security Agency) and U.S. Cyber Command’s quiet meeting with President-Elect Trump shortly after the election. …It has been reported that Admiral Rogers did not inform his “superiors” of the meeting with President-Elect Trump. President Obama is out of the country. Def Sec Ash Carter and DNI Chair James Clapper, both loyalists to President Obama, do not necessarily align with Admiral Rogers (they would also be the “superiors” per se’)…. (Via Reuters) The heads of the Pentagon and the U.S. intelligence community have recommended to President Barack Obama that the director of the National Security Agency, Admiral Michael Rogers, be removed from his position, sources familiar with the matter said on Saturday…. A wee bit of sneakernet?